It really is quite amazing how the technology of only a few years ago, which then was found only in the best and most costly of camera gear, has rapidly trickled down to equipment that the majority of consumers, professional or not, can easily afford without taking out a second mortgage on the house. We see this trickle down process in our cameras, cell phones, studio lights and, now, even in our tripods and heads. 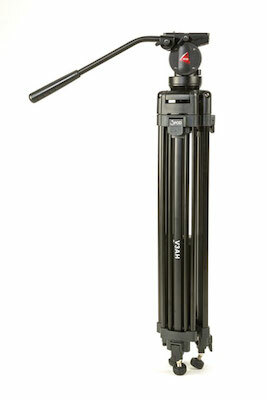 Adorama, long a large East coast distributer of film and photo equipment, continues to extend their own line of photo and video equipment with the release of the surprisingly inexpensive 3Pod Aluminum tripod with a fluid head of its own. It is my sincere hope that by now the general public in the market realizes that the cheap $15 dollar tripod often "thrown in free with a purchase" is not worth bothering with for any shooter of either video or photography. With legs that quickly become bow-legged and heads that cannot pan or tilt smoothly without herky jerkiness, their usefulness is quite limited and a threat to anyone with standards of quality. One can spend thousands on a quality tripod and just as much as on some of the better heads. However, not everyone can afford the luxury of such grand quality. My own tripod certainly does not cost thousands of dollars, but it has served me very well over the years and remains in top condition to this day. 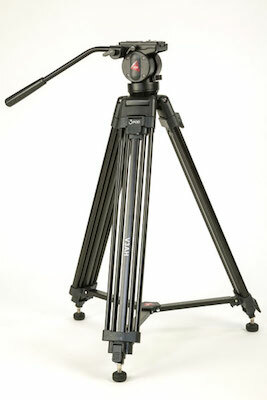 The new Flashpoint 3Pod tripod is even less costly than my own and yet, it might do just as well over time. What impressed me most upon pulling the tripod out of its supplied carry bag was just how sturdy this tripod is. It felt heavier than the 9.25 lbs. Adorama says it weighs but, then again, I got slapped by my first wife when I guessed that she weighed more than she did, so what do I know? With a maximum load capacity of 14.5 lbs, this tripod will be able to handle the majority of cameras and camcorders on the market today. A minimum closed height of 28" and a maximum height of 61" is better than many tripods, and allows you greater flexibility in terms of height set up prior to your shoot. Sturdy clips hold the tripod's legs together very solidly when transporting. 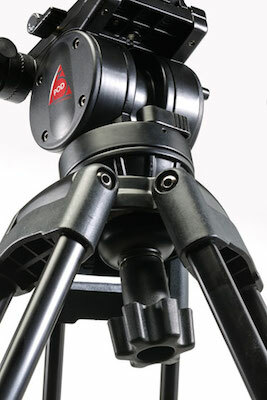 The Flashpoint 3Pod tripod's legs are made of black anodized aluminum. Aluminum is definitely not as expensive as carbon fiber legs might be, but these legs are not 3 big round and heavy legs as you might often see elsewhere. 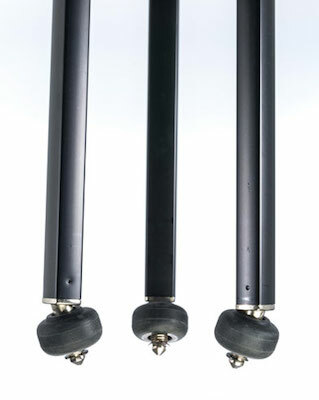 Each leg consists of 4 strong rods, and even their appearance lends itself to an air of professionalism. Each leg uses positive flip locks to extend and secure the tripod legs. I like these type of locks as they are just easy to use and more hardily constructed than the turn and twist knobs found on many consumer tripods. The legs, when opened, have a 41" footprint diameter which is fine for all but the tightest camera placements. The legs also come with a fixed and angled rubber foot, which can be retracted up to reveal solid spikes, and a center brace adding to greater stability and safety for different filming environments. As was noted previously, the tripod does come with its own slightly padded travel bag. When I look at any kind of camera, stand or light bag the first thing I want to see is a high quality zipper, one that will zip smoothly up and down, one with larger teeth than a jeans zipper and one I can look forward to many years of constant use without difficulty. I would not expect that from this supplied bag as the zipper is not as smooth as one might hope for, but it will certainly protect your tripod for quite a long time or until you purchase a higher quality carry bag or case. The supplied travel bag does the job in both the protection and transport mode. I wouldn't expect it to stand up to constant use however. The supplied head for the Flashpoint 3Pod tripod is a true fluid head, not 'fluid like' or 'hold it under water to get fluid action'. It comes with a 50mm leveling ball which is a mandatory feature on any tripod I would consider purchasing. For quick set up and shoot, no need to spend endless minutes trying to get the tripod legs to be perfectly at the correct extended distance, which would be impossible on a hilly placement anyway. You just set up the tripod and create a level horizon from the leveling ball. The head does have its own bubble level to assist you in the set up. I found the head's quick release camera mounting plate to be easy to use and set firmly in position. Additional mounting plates may be purchased at a nominal cost for quickly switching out cameras. 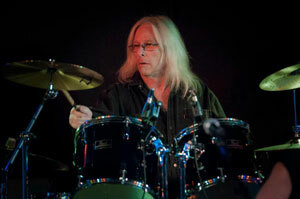 Panning and tilting were both very smooth and accurate and produced no kickback once you reach the point of release. Friction for the pan and tilt modes is fixed so there is no ability to adjust that friction. For some, this might be an issue that would dissuade you from a possible purchase. However, I have found it fairly rare that I need to adjust my own tripod's friction, and the fixed friction of this head, for me, seems to be just about right. I, however, did find it odd that you can lock the tilt function with the head's locking lever, but not the pan function. I am not going to say that, if you can afford it, you should forego considering that $1200.00 tripod and head you've been drooling over. But I do take umbrage with those who insist that only a gold plated, super charged, nuclear assisted tripod designed by Fabrage' is the only way to go. 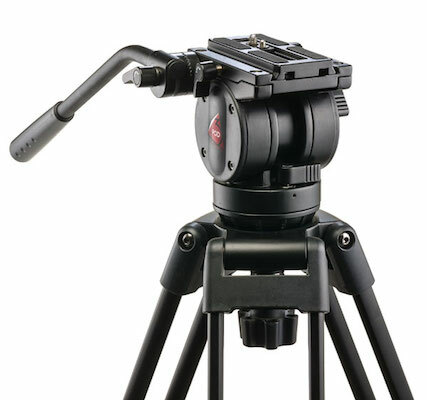 The Flashpoint 3Pod V3AH Tripod and fluid head are amazing at this price point. You certainly couldn't have gotten this quality in a tripod for this price a few years ago. Yes, there are a couple of short comings, which I pointed out, but I do not see them as being make or break points. 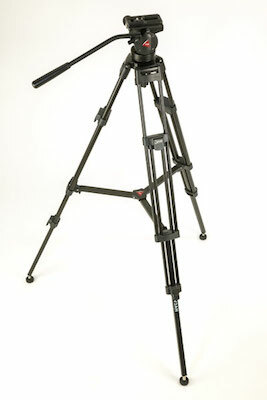 Rather I see the Flashpoint Tripod as a great and inexpensive avenue to a quality piece of necessary gear. Thumbs up!